Ilex aquifolium is a dioecious species, so both male and female flowers are required for reproduction. Both sexes produce creamy, white flowers in the beginning of spring and depend on honey bees for fertilization. Up to 8 female trees can be pollinated by a single male, but for optimum production a 1:3 ratio is suggested. A Holly flower has many distinct characteristics. The sepals are egg-shaped, tend to be 4 or 5 lobed and have a membranous coating. There are typically 4 stigmas all of which lack stalks and lie directly above the ovary and ovule. The oblong anthers are attached to the corolla by stalks and together they make up the pollen producing stamens. Female flowers also have stamens, but they are most often sterile. In rare cases the fertile stamens of female flowers will self-fertilize the ovary. The ovary of the flower is typically 4-6 celled, while the berry contains a 4-5 celled stone or 4 stones. Several animals other than bees also take part in the reproduction of Holly. 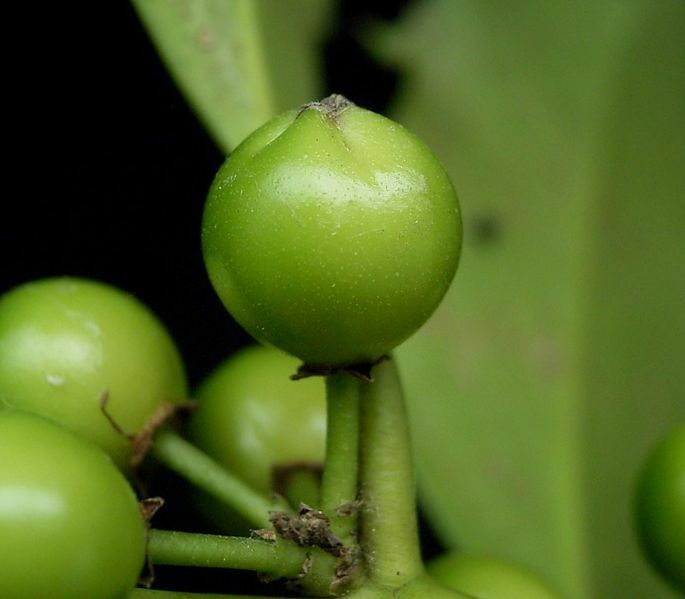 Many animals contribute to the widespread habitat of Holly by ingesting ripe berries and discarding fertilized seeds in their feces. Thrushes, raccoons, and rabbits are just some of the many animal species that enjoy a flavorful Holly berry snack. Figure 1: English Holly is a dioecious species. The top branch above and the flower in the top, right corner are taken from a male tree. The bottom branch above and the flower in the bottom, right corner are taken from a female tree. Figure 2: Angiosperm Life Cycle. 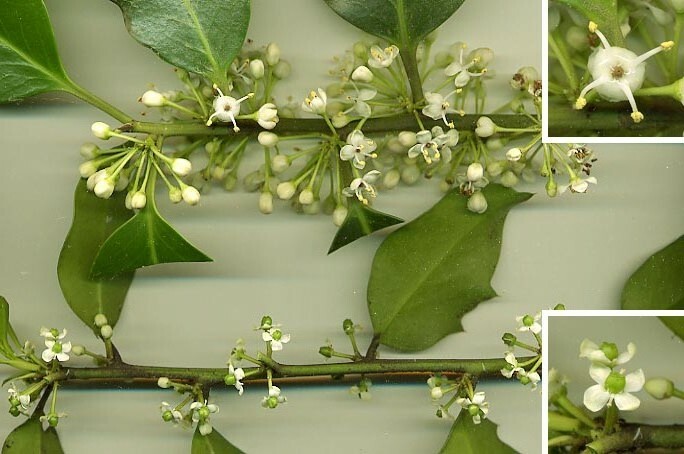 English Holly experiences a similar life cycle to thousands of other dioecious flowering plants. It all begins with two plants, one male and one female. The ovary of the female plant is located inside the flower. Ovules are located inside the ovary and undergo meiosis of the macrospore followed by mitosis to create a megagametophyte or embryo sac. 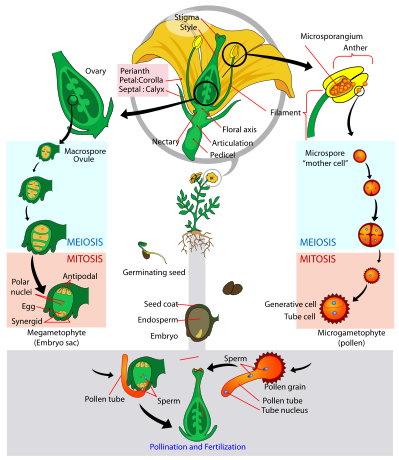 In the male plant there are numerous microsporangium that undergo meiosis and then mitosis creating a microgametophyte, more commonly known as pollen. Pollination occurs when bees or any number of small animals transfer the pollen from the male plant to the female plant. The pollen travels down the pollen tube and finally reaches the embryo. Fertilization takes place, followed by germination and before you know it the cycle begins all over again.